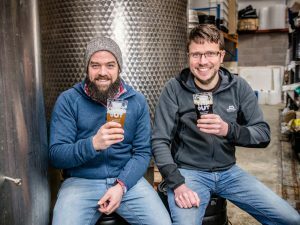 Top Out Brewery on the southside of Edinburgh has just won four awards at the 1st Annual Berlin International Beer Competition. The craft brewer’s Cone IPA and Smoked Porter won Gold medals, because the trade buyers ‘love it’. Simon Says-on won a respectable bronze medal, while Top Out also won the accolade of ‘Scotland Brewery of the Year’. 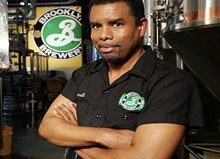 “We picked three interesting beers we thought would do well and then waited for the results,” says Head Brewer, Michael Hopert. “Three out of three beers won medals so we’re delighted. 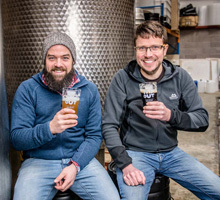 Both Michael Hopert and co-owner Andi Scheib are German, so it makes sense for them to export their uncompromising beers from Scotland to Germany. The Cone is an American-style IPA, takes its name from the hop plant, and receives rave reviews for its intense, complex hoppy profile. The Smoked Porter is full flavoured and smooth, and aptly combines notes from both German beech wood and Scottish peat smoke. Simon Says-on is a pink Berry Saison fruit beer, brewed in collaboration with Simon Martin from Real Ale Craft Beer, Britain’s most popular video beer reviewer. The competition featured close to 100 beers from countries around the world, and the blind judging panel is trade-only. The competition helps beers break into the European Market by having the beers tasted by multiple trade buyers. Like the New York competition, the judges at the Berlin competition were retail buyers, hotels, restaurants, distributors, mixologists, and importers. These judges’ livelihood relies upon knowing what consumers want, as they receive feedback on a daily basis on what’s good and sells. The panel included drinks industry professionals from Austria, the UK, France, Italy, Denmark, the Netherlands and elsewhere. 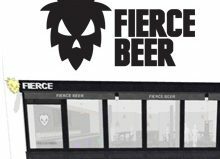 Top Out Brewery has a growing stable of core beers, from pale ales to Altbier and wheat beer, and a steady stream of unusual seasonal beers and collaborations. 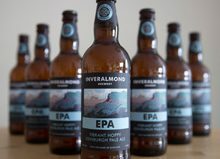 All Top Out’s beers have distinctive labels which show famous climbing routes up Scottish or Welsh mountains.